Take a creative person and stir in the aptitude thoroughly, from the start. In time, mix in the aesthetic flavouring with the most appropriate tool at hand, and then fold into the mix as much of the hard work and sweat that the mix can take. Sprinkle in the ideas. The more the better, and finally as all is cooking, a pinch of salt of the earth to give it the necessary character. Leave to cook over time and serve when required. Tasty treat in a tasteless world. 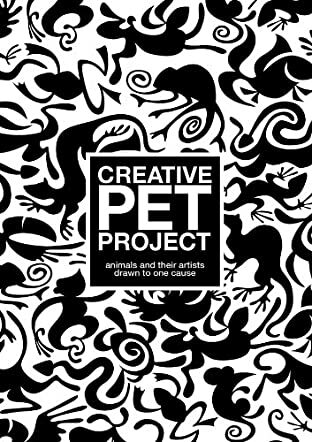 The Creative Pet Project (Animals and their Artists Drawn to One Cause) compiled by Rob Snow is a coffee-table-sized book containing an eclectic collection of international artists. These artists are working in a diverse variety of mediums ranging from ink on glass, pen, charcoal, and ink on paper, to acrylics and oils on canvas, and even digital works. All the art is worthy of inclusion in this book and spans techniques including surrealism, impressionism, caricature, woodcut, illustration, and all with a common theme: the role of animals and insects in the world, whether real or fantasy. The main theme of the book is how animals and art can be interlinked. Towards that goal, the Creative Pet Project sponsors selected over a hundred artists from twenty-six countries, not an easy task with over a thousand original entries from which to choose. Each artist has contributed a biography that includes typical curriculum vitae details and why they selected their preferred medium or how they developed their style. Yet, just as importantly, each description shares center stage with the animals in their own lives, explaining how they provide inspiration or otherwise influence the artist’s work. The first portion of the book is a short catalog of charitable organizations from around the world currently working to protect animals; each contributed to the creation of the book in some way. They explain their charters, goals, and progress, and contribute some wonderful photographs of their success stories. There is definitely something in the Creative Pet Project collection of artwork for every art lover, and it would make a fine addition to any collection.